"Gatorbait" redirects here. For the 1974 movie, see 'Gator Bait. The Florida Gators are the athletic teams that represent the University of Florida. The University of Florida, its athletic program, its alumni and its sports fans are often collectively referred to as the "Gator Nation." The Gators compete in the National Collegiate Athletic Association (NCAA) and the Southeastern Conference (SEC) and are consistently ranked among the top college sports programs in the United States. The University of Florida currently fields teams in nine men's sports and twelve women's sports. All Florida Gators sports teams compete in NCAA Division I, and 20 of the 21 Gators teams compete in the SEC. The sole University of Florida sports team that does not play in the SEC is the women's lacrosse team, which joined the American Athletic Conference after the 2018 lacrosse season. The University of Florida was one of the thirteen charter members who joined together to form the new Southeastern Conference in 1932. Previously, the university was a member of the Southern Intercollegiate Athletic Association from 1912 to 1921 and the Southern Conference from 1922 until the SEC began play in the fall of 1933. All Florida Gators sports teams have on-campus facilities, and most are located on or near Stadium Road on the north side of campus, including Steve Spurrier-Florida Field at Ben Hill Griffin Stadium for football, the Exactech Arena at the Stephen C. O'Connell Center for basketball, gymnastics, swimming and diving, indoor track and field, and volleyball, Alfred A. McKethan Stadium for baseball and James G. Pressly Stadium for soccer and outdoor track and field. The Katie Seashole Pressly Softball Stadium and the Florida Lacrosse Facility are located on Hull Road on the southwestern side of the campus. The Mark Bostick Golf Course and Scott Linder Stadium for tennis are located on S.W. Second Avenue on the northwestern side of the campus. The Florida Gators athletic program is administered by the University Athletic Association, Inc. (UAA), a private non-profit corporation that reports to the president of the university and its board of trustees. For the 2014–15 school year, the UAA had an operating budget of $103,310,001, projected revenues of $104,064,487, and made a $3.5 million contribution to the university's general fund. Scott Stricklin has been Florida's athletic director since 2016. Beginning in the early 1990s, the Florida Gators has been recognized as one of the premier athletic programs in the Southeastern Conference (SEC) and one of the best in the nation. The SEC has awarded an All-Sports Trophy to the best overall sports program in the conference since 1984, and Florida has won the award 27 times as of 2017. Florida is the only school in the SEC and one of four schools nationally to have won a national championship in the football, men's basketball, and baseball. Every year since 1983, the National Association of Collegiate Directors of Athletics (NACDA) has recognized the Gators athletic program as one of the ten best overall Division I athletic programs in the country in its annual NACDA Directors' Cup standings. The men's athletic program was also the winner of the 2010–11 and 2011–12 Capital One Cup; the women's athletic program won the Capital One Cup in 2013–14, and both programs have placed in the top five in the standings on several other occasions. Stylized script "Gators" logo, used on Gators football helmets. Among the Gators' recent national championships, the Florida Gators men's basketball team won the 2006 and 2007 NCAA Division I Men's Basketball Tournaments, and the Florida Gators football team won 2007 BCS National Championship Game in football, all in the space of 366 days. Florida is the only school in NCAA Division I history to hold the men's basketball and football championships during the same school year. In January 2009, the Gators football team won the 2009 BCS National Championship Game with a 24–14 victory over the Oklahoma Sooners. The Florida Gators baseball team took home its first championship at the 2017 NCAA championship, defeating rival SEC foe the LSU Tigers in two games. The Gators won the NCAA men's indoor track and field championship in three consecutive seasons in 2010, 2011 and 2012, the NCAA women's swimming and diving team national championship in 2010, the NCAA women's tennis championship in 2011, 2012 and 2017, the NCAA men's outdoor track and field championship in 2012, 2013 and 2016, the NCAA women's gymnastics championship in 2013, 2014 and 2015, and the NCAA softball championships in 2014 and 2015. Individual Gator athletes have won 279 individual NCAA championships in boxing, golf, gymnastics, swimming and diving, tennis, and track and field. In 2017, Florida won the baseball national championship for the first time. The Gators swept LSU in the best of three national title series. This earned the university a total of 39 national team championships. Additionally, this put the University of Florida in exclusive company. With the 2017 baseball national championship, Florida became only the fourth school in history to win national championships in football, men's basketball, and baseball. Florida, along with Michigan, Ohio State, and UCLA are the only schools to ever achieve triple crown status. This also put Florida in a category by itself. Florida is the only Southeastern Conference school to accomplish this feat, as well, Florida is the only school in history to have achieved triple crown status in such a short span of time. Florida's national championships in the big three sports (football, men's basketball, and baseball) were won in the span of just over two decades. The University of Florida has been ranked among the nation's top ten NCAA Division I athletic programs every year since 1983–84, an overall ranking that includes both men's and women's sports – the only college sports program ranked in the top ten in the United States for the last thirty-two consecutive years. The National Association of Collegiate Directors of Athletics (NACDA) has recognized the University of Florida as ranking among the top seven Division I programs in its NACDA Directors' Cup standings every year since the NACDA and USA Today began awarding the cup in 1993–94. The 2014–15 academic year marked the Gators' thirty-second consecutive year ranked among the nation's top ten best overall collegiate athletic programs, and the twenty-second consecutive year ranked among the top seven Division I programs in the NACDA Directors' Cup standings. Only one other Division I athletic program has matched that feat, and Florida has achieved this record while fielding fewer sports teams than many of the other perennially top-ranked collegiate athletic programs. In the twenty-two years of the NACDA Directors' Cup, the Gators have finished fifth or better in fifteen years, and have never finished lower than seventh; the only other program ranked among the top ten Division I programs every year since 1993–94 is the Stanford Cardinal sports program of Stanford University. Through the end of the 2017–18 school year, the Florida Gators have won 240 Southeastern Conference (SEC) team championships, the most in conference history. The SEC All-Sports Trophy began in 1973 as the Bernie Moore Trophy and tabulated the league's best men's sports program. In 1983, the SEC also began recognizing the best women's sports program in the conference, as well as the best overall SEC sports program. In 1994, the New York Times Regional Newspaper Group assumed responsibility for awarding the trophies. In the 39-year history of the awards, Florida has won nineteen Women's Trophies, sixteen Men's Trophies, and twenty-five Overall SEC All-Sports Trophies (including twenty-five of the last twenty-seven). SEC rival Georgia won the overall 2005–06 All-Sports Trophy to snap Florida's record streak at fourteen straight (1990–91 through 2004–05). Florida reclaimed the SEC All-Sports Trophy for the 2006–07 school year, and the Gators again swept the overall, men's, and women's all-sports trophies in every year since. The Gators are the only SEC sports program to earn all three SEC all-sports trophies in a single year, and have swept all three trophies twelve times. 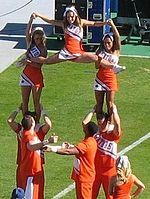 In their 108-year history of intercollegiate competition, the University of Florida's varsity athletic teams have won 41 national team championships (including 36 sponsored by the National Collegiate Athletic Association (NCAA), two by the Association for Intercollegiate Athletics for Women (AIAW), two by the Bowl Championship Series (BCS), and one by the Bowl Alliance), and its individual athletes have won 279 individual NCAA national championships. Florida is the only Division I school to hold both major men's championships at the same time (as the 2006 BCS football champions and the 2006 and 2007 NCAA men's basketball champions). The national intercollegiate sports championships listed above were sponsored by the NCAA unless otherwise noted in the footnotes. The University of Florida is a founding member of the Southeastern Conference (SEC), one of the nation's premier intercollegiate sports conferences, and twenty of the twenty-one Gators sports teams compete in the SEC. Since the SEC began play in 1933, Florida's varsity athletic teams have won 242 SEC team championships, more than any other conference member. The women's lacrosse team played its first four seasons in the now-defunct American Lacrosse Conference (ALC), followed by four seasons in the Big East Conference, and joined the American Athletic Conference for the 2019 season (2018–19 school year) and beyond. All of Florida's conference championships are from the SEC unless otherwise stated. † Wrestling is no longer offered at the varsity level since 1979. Coach Andy Lopez took over the Gators baseball program in 1994, one season after leading the Pepperdine Waves to their first College World Series championship. In 1996, he coached the Gators to a fifty-win season and a College World Series bid. By 2000, the program had seemingly hit a plateau and Lopez was replaced. Pat McMahon became the Gators' head coach in 2001 after coaching the Mississippi State Bulldogs. The Gators' 2005 baseball season was the most successful to date, with the team winning the SEC title, and earning a place in the College World Series for the fifth time in school history. The team advanced to the championship round against the Texas Longhorns, ultimately losing two games to none. Following their 2005 College World Series run, the Gators opened the 2006 season ranked number one in the polls, but struggled to finish 28–28 record (10–20 SEC), and failed to qualify for the NCAA Regionals. After missing the NCAA Regionals again in 2007, McMahon was dismissed. Former Clemson Tigers associate head coach Kevin O'Sullivan became the Gators' new head baseball coach on June 13, 2007. O'Sullivan's Gator teams showed immediate improvement and the Gators finished the 2008 regular season with a 30–24 record (17–13 SEC), and received an invitation to the NCAA Regional in Tallahassee. The 2009 squad finished the regular season with a 38–18 record (19–11 SEC), won the NCAA Regional in Gainesville, and advanced to the Super Regional before losing to the Southern Mississippi Golden Eagles. O'Sullivan's 2010 and 2011 Gators finished their SEC regular season play with identical 22–8 records, won the program's eleventh and twelfth SEC championships, earned a berth in the College World Series in both years, and advanced to the College World Series final in 2011 before losing to South Carolina two games to none. The Gators returned to the College World Series in 2012, 2015, 2016, and 2017. In June 2017, Florida won their first College World Series championship, beating LSU two games to none in the best-of-three finals. The Gators baseball team plays its home games at Alfred A. McKethan Stadium at Perry Field. Florida enjoyed limited success in men's basketball before the mid-1980s. Coach Norm Sloan's Gators were invited to the National Invitation Tournament (NIT)—only the second time the team had been invited to a post-season tournament. They returned to the NIT in 1985 and 1986, and made their first appearance in the NCAA Basketball Tournament in 1987, when guard Vernon Maxwell led the team to the NCAA Sweet Sixteen. The Gators received invitations to the NCAA Tournament in 1988 and 1989, but Sloan was forced to resign at the outset of the 1989–90 season as a result of NCAA infractions. Coach Lon Kruger brought renewed success, and his Gators reached the NIT final four in 1991–92. During the 1993–94 season, Andrew DeClercq and Dametri Hill led the Gators to their first NCAA Tournament Final Four following a dramatic victory over the Connecticut Huskies in the NCAA Regional Final. The 2005–06 national champion Gators with President George W. Bush at the White House. Athletic Director Jeremy Foley hired Billy Donovan as Kruger's replacement in 1996. Donovan's recruiting prowess was evident early, as he landed recruiting classes with future NBA players Mike Miller, Udonis Haslem and Matt Bonner. Donovan's Gators advanced to the NCAA Tournament final before losing to the Michigan State Spartans in 2000, and demonstrated a consistency previously unknown to the program as they received invitations to the NCAA Tournament every year from 1999 through 2007, a team-record eight-year streak. Under Donovan, Florida won its first SEC Men's Basketball Tournament in 2005, when they beat the Kentucky Wildcats in the SEC title game. The 2005–06 team's 17–0 start was the best in team history, surprising many with a young, selfless squad led by four sophomores. The team began the season unranked, but won its second consecutive SEC Tournament championship. On April 3, 2006, the Gators defeated the UCLA Bruins 73–57 in the NCAA Tournament championship game to win Florida's first men's national basketball championship. Within days, all five starters announced they would return for another season to try to win back-to-back championships. At the outset of the 2006–07 season, the Gators were ranked No. 1 in both major polls for the first time. The Gators won their second consecutive NCAA national men's basketball championship on April 2, 2007, defeating the Ohio State Buckeyes 84–75. They became the first team since Duke in 1991–92 to win back-to-back tournaments and the first in NCAA history to do so with the same starting line-up. Afterward, Florida's four star juniors announced they would enter the NBA draft. Donovan's Gators returned to championship form in 2010–11, winning the program's fifth regular season SEC championship and fighting their way to the NCAA regional semifinals (the "Elite Eight") before losing 74–71 to the Butler Bulldogs in overtime. In 2011–12, the Gators received a No. 7 seed in the NCAA tournament, exceeded expectations, and advanced to the Elite Eight, headlined by the play of star freshman Bradley Beal and point guard Erving Walker, before falling to Louisville. During the 2013–14 season, the Gators were ranked No. 1 in the nation, won the SEC championship with 36 straight wins during the regular season and tournament games, went on a school-record 30 game winning streak, and advanced to the NCAA Final Four, headlined by the play of four senior veterans: Patric Young, Scottie Wilbekin, Will Yeguete and Casey Prather. The Gators men's basketball team is currently led by coach Michael White, and plays its home games in the O'Connell Center. White's Gators returned to the NCAA Tournament in 2016–17 after a two-year absence despite finishing second in the SEC during the regular season and suffering an early exit from the SEC Tournament. The Gators, as a #4 seed, ultimately reached the Elite Eight before falling short against fellow conference partner South Carolina. Women's basketball was approved as a new women's varsity sport by Florida in March 1972, but began play in 1973 as a club team. In 1975, the Lady Gators debuted as a varsity program under head coach Dr. Paula Welch. The Gators made local headlines in 1976 by winning the "state championship", beating the other three women's college teams located in the state at that time. While traditionally being overshadowed by conference and national basketball powers Tennessee and Georgia, the Lady Gators have made several NCAA Tournament appearances and sent players to the WNBA, including DeLisha Milton-Jones. Carol Ross compiled more wins than any other women's basketball coach in Florida's history, and guided the team for twelve seasons from 1991 to 2003, but left to accept the head coaching job at her alma mater, Ole Miss. From 2002 through 2006, the women's basketball team was coached by Carolyn Peck, a former WNBA coach who won a national title with Purdue. Peck was fired midway through the 2006 season (though allowed to finish the season) after enduring the worst losing streak of any Gator sport. Former Gator player and previous Charlotte coach Amanda Butler was named the new women's basketball coach on April 13, 2007. During the 2008–09 season, the Lady Gators received an NCAA tournament bid, and won a first-round game before being defeated by eventual tournament champion Connecticut in the second round. Butler resigned after the 2016–17 season. The Gators women's basketball team plays its home games in the O'Connell Center. The Florida Gators men's cross country team has won three Southeastern Conference championships (SEC), and has competed in eight National Collegiate Athletic Association (NCAA) tournaments. The women's cross country team has also won five SEC Championships (including the most recent), and competed in ten NCAA tournaments. In 2009, the Lady Gators placed seventh at the NCAA cross country championship; in 2010, they won the SEC championship for the second consecutive year. Coach Mike Holloway is the head coach of the men's and women's cross country teams. The University of Florida fielded an official varsity football team for the first time in 1906, defeating the Gainesville Athletic Club 6–0 in its first game. Since then, the Gators have played in thirty-seven bowl games, won three national championships (1996, 2006, 2008) and eight Southeastern Conference championships, and produced 138 All-Americans, forty-two National Football League (NFL) first-round draft choices and three Heisman Trophy winners. The Gators' most prominent current football rivals are SEC Eastern Division foes Georgia and Tennessee, annual SEC Western Division opponent LSU, and in-state rival Florida State from the Atlantic Coast Conference (ACC). Florida has historically shared rivalries with Auburn and Miami, too, but those games are no longer played annually and have lessened in intensity. The Gator football team has obtained more victories than any other program in the NCAA's Football Bowl Subdivision (FBS) since 1990, the year Heisman Trophy-winning quarterback Steve Spurrier returned to his alma mater as head coach. The 1996 team, coached by Spurrier and led by another Gator Heisman-winner, Danny Wuerffel, finished with a 12–1 record and won the national championship in the Sugar Bowl, beating rival Florida State 52-20. This win was not without controversy from FSU fans who thought they should not have had to play Florida again. FSU won in the regular season match up 24-21. Steve Spurrier-Florida Field at Ben Hill Griffin Stadium, home field of the Gators. Urban Meyer became Florida's head football coach in December 2004, and his six teams had great success from 2005 to 2010. The 2006 team won the school's second national championship on January 8, 2007, defeating the number one-ranked Ohio State Buckeyes 41–14. Quarterback Tim Tebow won the Heisman Trophy in 2007, and Florida's Tebow-led 2008 team won the 2009 BCS National Championship Game on January 8, 2009, beating the top-ranked Oklahoma Sooners 24–14, for the Gators' third national championship. The Gators have won the SEC Championship Game a record seven times in eleven appearances since the SEC instituted the championship game in 1992. The Gators won their first official conference title in 1991, the year before the first SEC conference championship game was played, for a total of eight SEC championships in the last twenty-four seasons. The Gators football team plays its home games in Steve Spurrier-Florida Field at Ben Hill Griffin Stadium, more popularly known as The Swamp, the team's home field since 1930. Dan Mullen is the current head coach of the Florida Gators football. The men's golf team has won four NCAA Championships (1968, 1973, 1993, 2001), and has produced two individual NCAA champions, Bob Murphy in 1966 and Nick Gilliam in 2001. The men's golf team has also won fifteen Southeastern Conference (SEC) championships: 1955–56, 1968, 1973–75, 1985, 1989, 1991–94, 1999, 2003, 2011. Numerous former Gator golfers have represented the University of Florida on the PGA Tour, and the program has produced over thirty male athletes who have competed professionally. Buddy Alexander, the long-time head coach for the men's golf team, retired after the 2013–14 season. J. C. Deacon was hired in June 2014, and the 2014–15 season will be his first. The Gators men's golf team plays its home matches at the Mark Bostick Golf Course (formerly known as the "University Golf Course"). The women's golf team has won two NCAA team championships (1985, 1986), and has produced one individual NCAA champion, Page Dunlap. The women's golf team has also won eight Southeastern Conference (SEC) championships. Former Lady Gator golfers have regularly represented the University of Florida on the LPGA Tour, and the program has produced over twenty female athletes who have competed in the professional ranks. Emily Glaser is the head coach for the women's team. The Gators women's golf team plays its home matches at the Mark Bostick Golf Course (formerly known as the "University Golf Course"). Gymnastics was one of the first women's sports added at the University of Florida and achieved early success by winning the 1982 AIAW national championship. Since the NCAA assumed sponsorship of the national gymnastics championships in 1982, Florida has typically earned invitations to the NCAA national championships (top twelve teams nationally), and advanced to the NCAA "Super Six" eighteen times. Florida won the 2013, 2014 and 2015 NCAA national championships, finished in second-place in 1998 and 2012, and the team has only failed to qualify for the NCAA championships once in the past thirty-three seasons. The Gators have won a total of nine SEC gymnastics championships since 1982. The team's biggest SEC rivals are Alabama and Georgia, both of which are also perennial national contenders. Coach Rhonda Faehn's Gator gymnasts were the SEC champions in both 2012 and 2013, and won the NCAA national team championships in 2013, 2014 and 2015 (the 2014 was as co-champions with Oklahoma). Faehn coached the Gators gymnastics team from 2003 to 2015. Under Faehn, the Gator gymnasts have been nationally competitive and remarkably consistent—finishing in the top seven every year and winning three NCAA national championships. The Gators gymnastics team is now coached by Jenny Rowland. The Gators hold their home meets at the O'Connell Center. In June 2006, the University Athletic Association announced the creation of the new Gators women's lacrosse program, citing the growth of high school lacrosse across the country and the increased availability of Division I competition. Florida became the second Southeastern Conference member university to offer lacrosse as a varsity sport, following Vanderbilt University, and played its inaugural 2010 season in the American Lacrosse Conference (ALC) together with the Commodores. The Gators and Commodores continued to play in the ALC until conference realignment led to the demise of the ALC following the 2014 season, after which both programs became single-sport members of the Big East Conference. The Gators and Commodores played in the Big East through the 2018 season, after which they became charter members of the new women's lacrosse league of the American Athletic Conference. The lacrosse team is the only Gators team that does not compete in the SEC. The Gators lacrosse team has had success over its first eight seasons, including four ALC regular-season championships (2011–2014); two ALC tournament titles (2012, 2014); both regular-season and tournament titles in all of its four Big East seasons (2015–2018); five appearances in the NCAA Tournament national quarterfinals ("Elite Eight"); and one appearance in the NCAA Tournament national semifinals ("Final Four") in 2012. The Gators have been ranked among the top ten women's lacrosse teams in the country each of the last five seasons, and have been ranked as high as No. 1. Amanda O'Leary is the Gators' head coach. Before she was named to jump-start Florida's new program, O'Leary was the head coach at Yale University for 14 seasons, and was honored as a two-time All-American midfielder at Temple University, where she led her team to an NCAA championship in 1988. In only the second season of the Gators lacrosse program, the mostly-sophomores team defeated the defending ALC champion Northwestern Wildcats to win their first regular season conference championship. The Gators completed a perfect 5–0 season three days later by defeating the Vanderbilt Commodores in Nasvhille. The Gators women's lacrosse team plays its home games in the 1,500-seat Donald R. Dizney Stadium. Becky Burleigh has been the head coach since the women's soccer team first began play a varsity sport in 1995. Under Burleigh's leadership, the team quickly became a national contender. In 1998, in the program's fourth season, the Gators won the NCAA national championship by defeating the defending national champion North Carolina Tar Heels 1–0 in the national finals of the NCAA Tournament. The women's soccer team has also won thirteen Southeastern Conference regular season championships and ten SEC tournament titles in its eighteen seasons of play. Notable former Gator soccer players include Abby Wambach, who is a member of the U.S. women's national team and scored the game-winning goal in the final game of the 2004 Olympic Games in Athens, Greece; Heather Mitts, who played for the gold medal U.S. national team in the 2008 Olympics in Beijing, China; Melanie Booth, who currently plays for the Canadian women's national soccer team; and Danielle Fotopoulos, who played professionally with the Carolina Courage. Savannah Jordan plays for the Portland Thorns and ranks second in Gators history behind Wambach for goals scored. The Gators women's soccer team plays most of its home games at James G. Pressly Stadium. Pressly Softball Stadium, home field of the Gators softball team. The University Athletic Association decided to create the women's varsity softball program in 1995, and the Florida Gators softball team officially started competing in the Southeastern Conference in 1997 under former head coach Larry Ray. Since the beginning of the program, the Florida Gators have had several notable successes, including four SEC championships, eight appearances in the Women's College World Series (2008, 2009, 2010, 2011, 2013, 2014, 2015, & 2017), and two College World Series national championship (2014 & 2015). The Gators won the SEC regular season championships in 1998, 2008, 2009, 2013, 2016, and 2017, as well as the SEC tournament titles in 2008, 2009 and 2013. In 2009, they played for the NCAA softball championship in the Women's College World Series, losing to the Washington Huskies in the final round. The Gators again advanced to the finals of the 2011 Women's College World Series before falling to the Arizona State Sun Devils. In 2014, the Gators defeated the Alabama Crimson Tide in the first two games of the three-game Women's College World Series to win their first NCAA national championship. In 2015, the Gators repeated as national champions by defeating the Michigan Wolverines in the full three games. The Gators would return to the WCWS finals in 2017 before losing to the Oklahoma Sooners in two games. The current head coach is Tim Walton; the 2015–2016 season will be his tenth as the Gators' coach. He was previously the head coach at Wichita State University and he played baseball for the University of Oklahoma and a minor league team affiliated with the Philadelphia Phillies. Through the end of the 2018 season, Tim Walton has acquired a 722-149 record, while at Florida. Following the conclusion of the 2018 season, Tim Walton was given a 10-year contract extension. The Gators softball team plays its home games at the Katie Seashole Pressly Softball Stadium. The Florida Gators men's swimming and diving teams have won NCAA national championships in 1983 and 1984, and has also won thirty-five Southeastern Conference team championships – including 2013 and 2014. The women's swimming and diving team has won AIAW and NCAA national championships in 1979, 1982 and 2010, and has also won seventeen SEC team championships. The Florida Gators' notable female swimmers include three-time Olympic gold medalist Tracy Caulkins, three-time Olympic gold medalist Nicole Haislett, and four-time Olympic gold medalist Dara Torres, who is also the first American swimmer to compete in five Olympic Games. The Gators' notable male swimmers include Olympic gold medalists Matt Cetlinski, Mike Heath, David Larson, Ryan Lochte, Caeleb Dressel, Anthony Nesty and Martin Zubero. The Gators have had an international flavor since the 1980s, when the Olympic success of Gator swimmers began to attract Canadian, European and Latin American swimmers to train under coach Randy Reese. That tradition continues in the present day under Gregg Troy, the head coach of the Gators men's and women's swimming teams. Troy served as the head coach of the U.S. Olympic men's swim team in 2012. Dale Schultz is the new head coach of the men's and women's diving teams, succeeding long-time coach Donnie Craine in 2014. The Gators swimming and diving teams hold their home meets at the O'Connell Center Natatorium and train in the Carse Swimming Complex. The Florida Gators have one of the strongest and most storied women's tennis programs in NCAA history, and the women's tennis team has won seven NCAA team championships (1992, 1996, 1998, 2003, 2011, 2012, 2017). The team has also produced three individual Gators who have won four NCAA singles championships: Shaun Stafford (1988), Lisa Raymond (1992, 1993), and Jill Craybas (1996). In NCAA championship doubles play, three Gators doubles pairs have won four NCAA doubles championships: Jillian Alexander and Nicole Arendt (1991); Dawn Buth and Stephanie Nickitas (1996, 1997); and Whitney Laiho and Jessica Lehnhoff (2001). The Gator women have also won seven Intercollegiate Tennis Association (ITA) national indoor championships (1988, 1991, 1992, 1996, 1997, 1999, 2017), and twenty-seven SEC team championships. The Gators have also claimed five SEC Tournament titles (1994, 2000, 2005, 2011, and 2016) in Men's Tennis and 20 in Women's Tennis (1982, 1990, 1991, 1992, 1993, 1995, 1996, 1997, 1998, 2000, 2002, 2003, 2004, 2005, 2006, 2010, 2011, 2012, 2013, and 2016). The Gators men's tennis team has a winning tradition and has won nine Southeastern Conference team championships. The Gator men have also produced two NCAA singles champions, Mark Merklein (1993) and Jeff Morrison (1999). Merklein and partner David Blair combined to win an NCAA doubles championship (1994). Bryan Shelton is the head coach of the men's tennis team, and coach Roland Thornqvist leads the women's tennis team. The Florida Gators tennis teams play their home matches at Linder Stadium at the Ring Tennis Complex on the university's campus. The Florida Gators men's track and field team has won six Southeastern Conference indoor championships, and four SEC outdoor championships. After finishing as the runner-up in both the NCAA indoor and outdoor meets in 2009, the men's team went on to win three consecutive NCAA indoor titles (2010-2012) and its first NCAA outdoor title (2012) over the next three years. The women's track and field team won the NCAA indoor championship in 1992. In addition, the women's team has won six SEC indoor championships, and four SEC outdoor championships. The head coach for the track and field program is Mike Holloway, and he is responsible for both the men's and women's teams. The assistant coaches are Steve Lemke, Adrain Mann, Nic Petersen, Chris Solinsky, & Mellanee Welty. The Gators men's and women's track and field teams hold their outdoor home meets at Percy Beard Track, which is part of James G. Pressly Stadium. The Gators began competing in women's volleyball in 1984 under coach Marilyn McReavy, but did not become nationally competitive until coach Mary Wise assumed control of Florida's program in 1991. During her twenty seasons as Florida's head coach, Wise has compiled a 632–69 win-loss record (.902), and her Gators teams have won nineteen SEC regular season titles and twelve SEC Tournament titles in her twenty seasons. The Gators have made nineteen trips to the NCAA Tournament, including seven NCAA Final Four appearances (1992, 1993, 1996, 1997, 1998, 2002, 2003). In 2003, they advanced to the NCAA national championship final, where they lost to the undefeated USC Trojans. Florida landed the nation's top 2008 recruiting class, as ranked by Prepvolleyball.com and Volleyball Magazine, and signed the nation's top recruit and Gatorade National Player of the Year, Kelly Murphy, as well as four other recruits ranked among the top fifty. Murphy garnered First-Team All SEC and a spot on the SEC All-Freshman Team with fellow Gators Colleen Ward and Kristy Jaeckel. Murphy would also gain the SEC Freshman of the Year, AVCA All-South Region Freshman of the Year, the AVCA National Freshman of the Year, and Volleyball Magazine's Freshman of the Year. She was also honored as an AVCA Third-Team All-American and a Volleyball Magazine Second-Team All-American. The Gators volleyball team plays its home matches in the O'Connell Center. In the past, the Florida Gators fielded varsity teams in men's boxing and men's wrestling. Gator boxer John Joca, a "Gator Great" member of the University of Florida Athletic Hall of Fame, won the NCAA national boxing championship in the 135-pound weight class in 1940. The Gators boxing team, however, was discontinued in 1943 during World War II, and was never revived after the war. The Gators men's wrestling team was an SEC-sponsored sport from 1970 to 1979; the team won the 1975 SEC championship tournament and placed second during four other seasons. The wrestling team was eliminated as a result of cost-cutting and Title IX compliance issues in 1979. The University Athletic Association, under athletic director Ray Graves and associate director Ruth Alexander, desired to take a proactive role in Title IX compliance by balancing the number of available men's and women's athletic scholarships, and the resulting tight athletic budgets ultimately resulted in the elimination of men's wrestling program. Originally built in 1988, McKethan Stadium has played host to the Gators baseball team's home games as well as NCAA regional baseball tournaments for more than two decades. Renovated in 2007, the facility was expanded to seat up to 6,000 fans, and the locker rooms and offices were also upgraded. The Gators football team plays its home games in Steve Spurrier-Florida Field at Ben Hill Griffin Stadium. The stadium was originally constructed in 1930, and was known simply as "Florida Field." In 1989, it was renamed in honor of Ben Hill Griffin, Jr., an alumnus and generous donor to the university and its athletic programs. Since the arrival of coach Steve Spurrier in 1990, the stadium has become nationally known as the "Swamp." The Swamp has been renovated and expanded several times, and has included a natural grass surface since 1990. With the latest expansions, the stadium has an official capacity of 88,548 people, but routinely accommodates more than 90,000 fans for the Gators' home football games. The Swamp is the 12th largest college football stadium in America as measured by official seating capacity. Built in 1998 at a cost of $2 million, Carse Swimming Complex is a two-story, 7,000-square-foot (650 m2) facility that includes locker rooms, offices, and direct access to the UAA training pool. The swimming complex is located adjacent to the O'Connell Center. Completed in 2001, the Basketball Practice Complex is a two-story, 47,505-square-foot (4,413.4 m2) structure that includes multiple practice gyms, a training room, and a 1,900-square-foot (180 m2) weight room. Completed during the summer of 2009, the Florida Lacrosse Facility began hosting the women's lacrosse team with its first season in 2010. The 1,500-seat stadium runs the length of the game field, and the facility includes a second practice field. The facility also includes concessions, ticket offices, locker rooms and a training room. Pressly Stadium is a combined soccer and track and field facility that includes Percy Beard Track. The facility was renovated in 1995, when 2,500 bench seats were added to the existing 2,000-seat concrete grandstand, increasing the total seating capacity to more than 4,500 spectators. The stadium is located on campus, between McKethan Stadium and Linder Stadium, and was renamed in honor of James G. Pressly, Jr., a University of Florida alumnus and benefactor. The women's soccer team plays its home games in Pressly Stadium. Percy Beard Track was renovated in 1995 at a cost of $750,000, and the pole vault and long jump pits were moved from the infield to an area outside the track to accommodate the new soccer field. The men's and women's track and field teams host their home meets and the annual Florida Relays on Percy Beard Track during the outdoor track season. Constructed in 1996 at a cost of $2.6 million, Pressly Softball Stadium is the home field of the Gators women's softball team. The facility is located on campus, seats approximately 1,200 fans, includes a clay infield and a grass outfield, and complies with NCAA and Olympic specifications. The stadium is named for benefactor Katie Pressly. The Gators played their first game in the stadium against Stetson University on February 8, 1997. Built in 1995 and named in honor of donor Gale Lemerand, the Lemerand Center is a 43,000-square-foot (4,000 m2) all-sports facility that includes locker rooms, storage, and training equipment, and is used by all varsity athletes at the University of Florida. Designed by golf course architect Donald Ross and originally developed in 1963, the eighteen-hole Mark Bostick Golf Course is the official golf course of the University of Florida. The men's and women's golf teams play their home matches on the course, and the course also hosts the Gator and Lady Gator Golf Day Pro-Am. The course is 6,701 yards in length, and is rated as a par 70. In 2001, Bobby Weed renovated the course with a $4 million donation from benefactor Mark Bostick. The Guy Bostick Clubhouse is equipped with numerous amenities and includes over 8,000 square feet (740 m2) of interior space. Finished in 2008, Steinbrenner Band Hall is The Pride of the Sunshine's rehearsal hall, and also houses offices, instrument storage, the band library and an instrument issue room. Construction of the band hall was made possible by a generous gift from George Steinbrenner and his wife Joan in 2002. Originally constructed in 1987, Linder Stadium serves as the home court of the men's and women's tennis teams. The facility was renovated at a cost of $1.7 million in 1999, when the building interior space was expanded to 7,163 square feet (665.5 m2), and includes coaches' offices, a training room, locker rooms, and a 3,000-square-foot (280 m2) exterior courtyard. The stadium includes a 1,000-seat grandstand overlooking the six lighted main courts, and also includes a second row of nine practice courts. The complex is located on campus, adjacent to the College of Law and James G. Pressly Stadium. Constructed from 1977 to 1980, the O'Connell Center is a multi-purpose arena that is home to the men's and women's basketball, women's gymnastics, men's and women's indoor track and field, and women's volleyball teams. It is commonly known as the "O'Dome." In its major interior space, the O'Connell Center can accommodate over 12,000 sports fans, and the university also uses the facility for graduation ceremonies and a variety of concerts, lectures and shows. The O'Dome also includes the Natatorium, where the Gators swimming and diving teams compete. The O'Dome underwent a major renovation 2016 with upgraded luxury suites, concession stands, locker rooms, and a new main entrance facing Ben Hill Griffin Stadium, but the seating capacity was reduced to over 10,000 fans. Aerial shot of The Swamp, O'Dome, and Perry Field. The University of Florida's costumed mascots, Albert and Alberta. The University of Florida began its sports program soon after it was established in Gainesville in 1906, and its teams adopted orange and blue as their official colors soon thereafter. These colors are a probably a combination of the colors of the two primary institutions that merged to form the university, as the East Florida Seminary used orange and black and the Florida Agricultural College used blue and white. As with the school colors, the exact origin of the alligator (almost always shortened to "gator") as the school mascot is not well documented. It likely originated in 1908, when Gainesville merchant Phillip Miller chose the animal to adorn pennants he designed for sale to students. The school did not yet have a mascot, and Miller chose the alligator because it is native to Florida and was not claimed by any other school. The football team subsequently adopted the "Gators" nickname in 1911. There are two theories as how the name become synonymous with the university's athletic programs. One theory is that the 1911 football squad began calling themselves the Gators in honor of team captain Neal "Bo Gator" Storter. Storter himself refuted this explanation, saying that it originated when a sportswriter in South Carolina described Florida's 1911 road upset of Clemson as an "invasion of alligators from Florida" and the players adopted the name. Whatever its origins, the nickname "Gators" (and for a time, "Lady Gators" for women's sports) has been used by the University of Florida's athletic program for over a century. Albert and Alberta are the official costumed mascots of the Florida Gators. Many variations of Albert have been present at sporting events over the decades, and a live alligator was used for many years. The current version of Albert was introduced in the early 1980s, and Alberta joined him in 1984. They are unique among the SEC's mascots as the only male-and-female pair, and are featured together in a life-sized statue outside of UF's Alumni Affairs Building. Cheerleaders performing at a home football game. The "Gator Chomp" is a gesture made by Florida Gators fans and players to show their support of the Florida Gators sports teams. The chomp originated in 1981. The chomp is performed by fully extending one's arms, one over the other, in front of the body with the palms facing each other, and then moved apart and together to symbolize an alligator's mouth. When performed by fans at home football or basketball games, the chomp is often accompanied by Florida's marching band or pep band playing the two-note shark motif from the film Jaws. "Orange and blue" is a fan cheer that is popular at home sports events, with alternate stadium sections yelling "Orange! ", and answering back with their loudest "Blue!" This can go back and forth for several minutes, with both sections competing to be the louder. The football team had a long-time tradition of having George Edmondson Jr. — better known as "Mr. Two Bits"— wandering through the stands with a sign and a whistle to pump up the crowd to the "Two Bits" cheer. Edmondson officially retired in 2008, and was made an honorary alumnus in 2005. His final appearance as Mr. Two Bits was at the last home game of the 2008 season against The Citadel. The University of Florida's marching band is known as "The Pride of the Sunshine", and plays at every home football game, and also performs at various events such as Gator Growl and parades. The Gatorettes are the baton-twirlers, or majorettes, for the marching band. The Pride of the Sunshine plays the University of Florida Alma Mater at Florida Field before the start of every home football game. Following every home game, the entire football team gathers on Florida Field and joins fans in singing the Alma Mater while the band plays. Florida alumnus and former head football coach Steve Spurrier re-introduced this tradition to Florida Gators football games in 1990. Another football fan tradition, at home and on the road, is the Gator fans' linking arms, swaying, and singing "We Are the Boys from Old Florida" at the end of every third quarter. The University of Florida's fight song, "The Orange and Blue", is played frequently at all Florida Gators athletic events. The University of Florida dance team that performs at home basketball games and other sports events is known as the Dazzlers. Over 250 notable former Gators athletes and coaches have been inducted into the University of Florida Athletic Hall of Fame. Hall of Fame inductees fall into three categories: "Gator Greats"; "Distinguished Letterwinners"; and "Honorary Letterwinners." Gator Greats are those former athletes who distinguished themselves during their undergraduate sports careers, and include former All-Americans, all-conference selections, winners of major national awards, individual national champions, and those who significantly contributed to national team championships. Distinguished Letterwinners are those former Gators athletes who achieved distinction after graduation, as athletic coaches or administrators, professional athletes, or in public service or other career activities. Honorary Letterwinners are those persons who are not University of Florida alumni and former undergraduate athletes, but have distinguished themselves by their significant contributions to the success of Florida Gators sports teams, including former championship Gators coaches. Gator Greats include Heisman Trophy winners Steve Spurrier, Danny Wuerffel, and Tim Tebow; NFL Hall of Fame members Jack Youngblood and Emmitt Smith; Olympic gold medal swimmers Tracy Caulkins, Nicole Haislett and Dara Torres; individual NCAA golf champions Page Dunlap, Nick Gilliam and Bob Murphy; Olympic gold medal soccer players Heather Mitts and Abby Wambach; and individual NCAA tennis champions Jill Craybas, Jeff Morrison and Lisa Raymond. Distinguished Letterwinners include head coaches Doug Dickey, Lindy Infante and Dutch Stanley, as well as U.S. Senator George Smathers. Honorary Letterwinners include former Gators national championship coaches Buster Bishop, Andy Brandi, Randy Reese and Mimi Ryan, former football coach and four-star general James Van Fleet, as well as medical professor Robert Cade, who invented the sports drink Gatorade at UF in the mid-1960s as a rehydration aid to assist Gators athletes. The University of Florida has a reputation and long history of producing athletes who compete in the Olympic Games. Over 160 university alumni, including Florida Gators athletes from thirty-seven countries, have competed in the Games, winning fifty Olympic gold medals, twenty-nine silver medals and thirty bronze medals (through the end of the 2012 Summer Olympics). The list of notable Gator Olympians and gold medalists includes sprinters Kerron Clement, Dennis Mitchell, and Bernard Williams; marathon runner Frank Shorter; baseball outfielder Brad Wilkerson; basketball forward DeLisha Milton-Jones; soccer forward Abby Wambach; and swimmers Tracy Caulkins, Nicole Haislett and Ryan Lochte. Former Gator Dara Torres is the only American swimmer to compete in five Olympic Games (1984, 1988, 1992, 2000, 2008). At the age of 41, Torres became the oldest swimmer to win an Olympic medal when she won silvers in three events in 2008, finishing her career with a total of twelve Olympic medals (including four gold). ^ "UF Identity Style Guide". University of Florida. March 1, 2016. Retrieved March 19, 2016. ^ See, generally, GatorZone.com. Retrieved September 4, 2014. ^ NCAA.org, NCAA Members by Division, Division I Members Archived 2009-06-11 at the Wayback Machine. Retrieved July 13, 2009. ^ See website of the Southeastern Conference (SEC), SECSports.com. Retrieved July 12, 2009. ^ The SEC was founded in December 1932 but did not begin athletic competition until the fall of 1933 History of the Southeastern Conference. Retrieved July 12, 2009. ^ Roger Saylor, "Southern Intercollegiate Athletic Association Archived 2011-05-26 at WebCite", College Football Historical Society, The LA84 Foundation. Retrieved July 12, 2009. ^ SoConSports.com, The History of the Southern Conference. Retrieved July 12, 2009. ^ a b c d e f g h i GatorZone.com, Football, Ben Hill Griffin Stadium at Florida Field. Retrieved July 12, 2009. ^ a b c GatorZone.com, Men's Basketball Facilities, Stephen C. O'Connell Center. Retrieved July 12, 2009. ^ a b c GatorZone.com, Women's Basketball Facilities, Stephen C. O'Connell Center. Retrieved July 12, 2009. ^ a b c GatorZone.com, Gymnastics Facilities, Stephen C. O'Connell Center. Retrieved July 12, 2009. ^ a b GatorZone.com, Swimming & Diving Facilities, Stephen C. O'Connell Center. Retrieved July 12, 2009. ^ a b GatorZone.com, Indoor Track & Field Facilities, Stephen C. O'Connell Center. Retrieved July 12, 2009. ^ a b c GatorZone.com, Volleyball Facilities, Stephen C. O'Connell Center. Retrieved July 12, 2009. ^ a b c d GatorZone.com, Baseball Facilities, McKethan Stadium at Perry Field. Retrieved July 12, 2009. ^ a b c d e f GatorZone.com, Soccer Facilities, James G. Pressly Stadium. Retrieved July 12, 2009. ^ a b c d GatorZone.com, Track & Field Facilities, Percy Beard Track at James G. Pressly Stadium. Retrieved July 12, 2009. ^ a b c d e f GatorZone.com, Softball Facilities, Katie Seashole Pressly Softball Stadium. Retrieved July 12, 2009. ^ a b c d e GatorZone.com, Lacrosse Facilities, Donald R. Dizney Stadium. Retrieved July 12, 2009. ^ a b c d e f g h UFGolfcourse.com, Mark Bostick Golf Course at the University of Florida. Retrieved July 12, 2009. ^ a b c GatorZone.com, Men's Tennis Facilities, Linder Stadium at Ring Tennis Complex. Retrieved July 12, 2009. ^ a b c d GatorZone.com, Women's Tennis Facilities, Linder Stadium at the Ring Tennis Complex. Retrieved July 12, 2009. ^ University Athletic Association, website homepage. Retrieved July 11, 2009. ^ University Athletic Association, 2014–2015 Operating Budget Executive Summary. Retrieved September 4, 2014. ^ a b c d NACDA.com, Learfield Sports Directors' Cup Previous Scoring Archived 2011-01-02 at the Wayback Machine. Retrieved July 11, 2009. ^ See NCAA.com, NCAA History, Division I Football. Retrieved March 12, 2015. See also NCAA.com, NCAA History, Division I Men's basketball. Retrieved March 12, 2015. ^ Associated Press, "UF women win NCAA swimming championship", The Gainesville Sun (March 20, 2010). Retrieved March 21, 2010. ^ a b "Gator men repeat as indoor track national champs", The Gainesville Sun (March 12, 2011). Retrieved May 25, 2011. ^ Associated Press, "Florida women's tennis wins national championship", The Gainesville Sun (May 24, 2011). Retrieved May 25, 2011. ^ Associated Press, "UF men's track captures first NCAA Outdoor title", The Gainesville Sun (June 10, 2012). Retrieved June 10, 2012. ^ a b GatorZone.com, Athletic Department, Overview & History. Retrieved June 29, 2015. ^ Robbie Andreu, "UF athletics 4th in Directors' Cup", The Gainesville Sun (June 23, 2015). Retrieved July 1, 2015. ^ SECSports.com, SEC Record Book, SEC Championships (through 2007–08 school year). Retrieved July 7, 2009. ^ a b SECSports.com, 2008–09 SEC Championships. Retrieved July 7, 2009. ^ SECSports.com, SEC Record Book, Bernie Moore All-Sports Trophy. Retrieved July 10, 2009. ^ SECSports.com, SEC Record Book, Women's All-Sports Trophy. Retrieved July 10, 2009. ^ a b c d e Pat Dooley, "Florida wins another SEC All-Sports award", The Gainesville Sun (May 22, 2011). Retrieved May, 2011. ^ NCAA.org, National Collegiate / Division I Men's Championships Archived February 5, 2009, at the Wayback Machine. Retrieved January 30, 2012. ^ NCAA.org, National Collegiate / Division I Women's Championships Archived 2010-06-27 at the Wayback Machine. January 30, 2012. ^ a b NCAA.com, NCAA History, Division I Men's Basketball. Retrieved July 10, 2009. ^ In 1996, the Gators won the Bowl Alliance national football championship, as recognized by the Associated Press (AP) and Coaches Polls. The Gators won the Bowl Championship Series national football championship in 2006 and 2008. College Football Data Warehouse, Recognized National Championships by Year. Retrieved July 10, 2009. ^ NCAA.com, NCAA History, Division I Men's Golf. Retrieved July 10, 2009. ^ NCAA.com, NCAA History, Division I Women's Golf. Retrieved July 10, 2009. ^ The Gators won the AIAW gymnastics national championship in 1982, and the NCAA nation championships in 2013 and 2014. See Archives of the Association for Intercollegiate Athletics for Women (AIAW), Special Collections, University of Maryland, College Park Libraries. ^ NCAA.com, NCAA History, Division I Indoor Track & Field. Retrieved July 10, 2009. ^ NCAA.com, NCAA History, Division I Women's Soccer. Retrieved July 10, 2009. ^ NCAA.com, NCAA History, Division I Softball. Retrieved June 4, 2014. ^ The Lady Gators won the AIAW swimming and diving national championship in 1979. See Archives of the Association for Intercollegiate Athletics for Women (AIAW), Special Collections, University of Maryland, College Park Libraries. The Lady Gators won the NCAA swimming and diving national championships in 1982 and 2010. NCAA.com, NCAA History, Division I Women's Swimming & Diving. Retrieved July 10, 2009. ^ The Gators won the NCAA women's tennis championships in 1992, 1996, 1998, 2003, 2011 and 2012. NCAA.com, NCAA History, Division I Women's Tennis. Retrieved July 10, 2009. The Gators also won the Intercollegiate Tennis Association (ITA) Women's Indoor Championships in 1988, 1991, 1992, 1996, 1997 and 1999, but the University Athletic Association does not presently include these six ITA national titles among the thirty-three national championships officially claimed by the University of Florida's sports teams. See ITA Tennis, ITA National Women's Tennis Indoor Championship History. Retrieved July 10, 2009. ^ SEC Record Book, SEC Championships (through 2007–08). Retrieved July 7, 2009. ^ SECSports.com, Baseball Championships Archived 2008-05-28 at the Wayback Machine. Retrieved July 8, 2009. ^ SECSports.com, Miscellaneous Tournament Information - Champions. Retrieved July 8, 2009. ^ SECSports.com, SEC Record Book, Men's Basketball. Retrieved July 8, 2009. ^ SECSports.com, SEC Record Book, Men's Cross Country. Retrieved July 8, 2009. ^ College Football Data Warehouse, Southeastern Conference Champions. Retrieved July 8, 2009. ^ SECSports.com, Men's Swimming & Diving Record Book. Retrieved July 9, 2009. ^ SECSports.com, SEC Record Book, Men's Tennis. Retrieved July 8, 2009. ^ SECSports.com, Men's Indoor Track & Field Record Book. Retrieved July 9, 2009. ^ SECSports.com, Men's Outdoor Track & Field Record Book. Retrieved July 9, 2009. ^ SECSports.com, SEC Record Book, Women's Cross Country. Retrieved July 8, 2009. ^ SECSports.com, SEC Record Book, Women's Golf. Retrieved July 8, 2009. ^ SECSports.com, SEC Gymnastics History & Records Archived 2007-10-12 at the Wayback Machine. Retrieved July 9, 2009. ^ SECSports.com, SEC Record Book, Soccer. Retrieved July 8, 2009. ^ SECSports.com, SEC Softball 2009 Media Guide. Retrieved July 11, 2009. ^ SECSports.com, Women's Swimming & Diving Record Book. Retrieved July 9, 2009. ^ SECSports.com, SEC Record Book, Women's Tennis. Retrieved July 8, 2009. ^ SECSports.com, Women's Indoor Track & Field Record Book. Retrieved July 9, 2009. ^ SECSports.com, Women's Outdoor Track & Field Record Book. Retrieved July 9, 2009. ^ SECSports.com, SEC Volleyball 2007 - History. Retrieved July 9, 2009. ^ Brandon Zimmerman, "UF fires McMahon", Gainesville, Sun (June 7, 2007). Retrieved July 29, 2009. ^ Brandon Zimmerman, "UF selects baseball coach Archived 2007-09-22 at the Wayback Machine", The Gainesville Sun (June 13, 2007). Retrieved July 29, 2009. ^ "Florida takes down LSU for first national title". ^ GatorZone, Women's Basketball, 2000–09 Media Guide, History of Florida Women's Basketball. Retrieved July 29, 2009. ^ The Football Bowl Subdivision is frequently referred to by its former NCAA designation of "Division I-A." ^ VUCommodores.com, Lacrosse. Retrieved July 13, 2009. ^ "Florida, Vanderbilt Added To BIG EAST Women's Lacrosse Lineup" (Press release). Big East Conference. June 26, 2014. Retrieved July 3, 2014. ^ Jeff Barlis, "Lacrosse tops No. 2 Northwestern Archived 2011-07-22 at the Wayback Machine", The Gainesville Sun (April 14, 2011). Retrieved April 15, 2011. ^ "UF lacrosse team makes history Archived 2011-04-21 at the Wayback Machine", The Gainesville Sun (April 18, 2011). Retrieved April 19, 2011. ^ GatorZone.com, Soccer, Year-by-Year Schedule & Results. Retrieved July 30, 2009. ^ Report, Staff. "Alligator Awards: Who was Florida's best female athlete of 2016-17?". The Independent Florida Alligator. Retrieved 2018-01-10. ^ GatorZone.com, Softball, All-Time Results. Retrieved September 1, 2009. ^ a b c GatorZone.com, Softball, Roster/Bios, Tim Walton. Retrieved August 15, 2009. ^ a b Florida Swimming & Diving 2013–14 Media Supplement Archived May 21, 2013, at the Wayback Machine, University Athletic Association, Gainesville, Florida (2013). Retrieved July 26, 2014. ^ a b c d e Florida Women's Tennis 2013–14 Media Supplement, University Athletic Association, Gainesville, Florida (2013). Retrieved July 26, 2014. ^ Intercollegiate Tennis Association, ITA National Women's Team Indoor Championship History. Retrieved September 9, 2009. ^ a b c Florida Men's Tennis 2013–14 Media Supplement, University Athletic Association, Gainesville, Florida (2013). Retrieved July 26, 2014. ^ NCAA.com, Men's Tennis, Division I Men's Tennis History. Retrieved September 9, 2009. ^ GatorZone.com, Men's Tennis, Linder Stadium at Ring Tennis Complex. Retrieved July 12, 2009. GatorZone.com, Women's Tennis, Linder Stadium at the Ring Tennis Complex. Retrieved July 12, 2009. ^ Incoming freshman class rated No. 1 by Prepvolleyball.com. Retrieved September 12, 2009. ^ F Club, Hall of Fame, Gator Greats Archived 2011-07-26 at the Wayback Machine. Retrieved June 10, 2010. ^ NCAA Championship Records Book, Discontinued Championships, National Collegiate Athletics Association, Indianapolis, Indiana, p. 261 (2009). Retrieved June 10, 2010. ^ a b E.C. Wallenfeldt, The Six-Minute Fraternity:The Rise and Fall of NCAA Tournament Boxing, 1932–60, Praeger Publishers, Westport, Connecticut, pp. 111–113 (1994). Retrieved July 30, 2010. ^ "Wrestling eliminated by the Florida Gators". ^ GatorZone.com, Men's Basketball, Florida Basketball Practice Complex. Retrieved July 29, 2009. ^ University of Florida, History, 1906–1927: Early Gainesville Archived 2008-12-27 at the Wayback Machine. Retrieved July 12, 2009. ^ "History of the Gator". Official website of Gator Athletics. University of Florida. Retrieved 17 October 2017. ^ "1911 Florida Gators". University of Florida archives. George Smathers Library, University of Florida. Retrieved 17 October 2017. ^ GatorZone.com, Gator Spirit Squads, University of Florida Mascots!. Retrieved July 12, 2009. ^ Hutchins, Andy. "Florida Gators mascots Albert, Alberta getting new costumes". Alligator Army. Retrieved 2016-04-23. ^ "There's no debate about the greatness of Tebow", Los Angeles Times (January 9, 2009). ^ David Stirt, Glenn Danforth and Danny Wuerffel, Saturdays At the Swamp, p.118. ^ GatorZone.com, Gators in the Olympics. Retrieved January 27, 2015. ^ a b USA Swimming, Dara Torres. Retrieved July 28, 2009. ^ Gator Boosters, Gator Benefactors. Retrieved August 15, 2009.